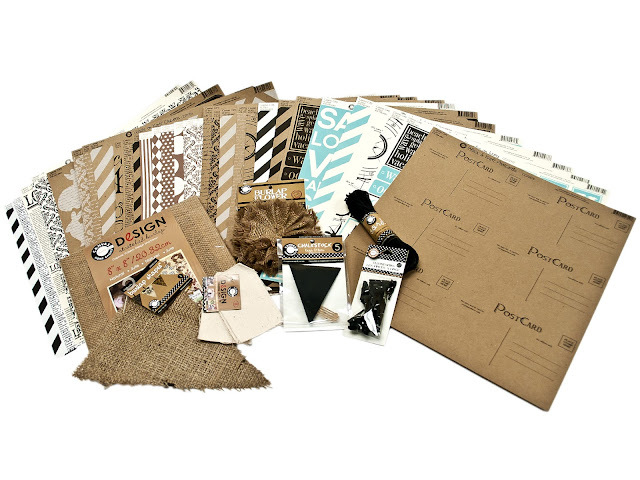 Swirlydoos Scrapbook Kit Club: Swirlydoos March Kit Reveal and Blog Hop!!! Welcome to Swirlydoos' March Kit Reveal Blog Hop Block Party!! We have some amazing projects for you to see today and as a bonus we have 2 manufacturer blogs that are joining in the fun and a 3rd manufacturer offering a prize!! There are 4 prize packs up for grabs so make sure to follow along and have fun!! Isn't she purdy?! Dripping with yummy bling and gorgeous papers. Go to our home page to get all of the details. Take a look at the treasures that could be all YOURS for taking part in our hop!!!! 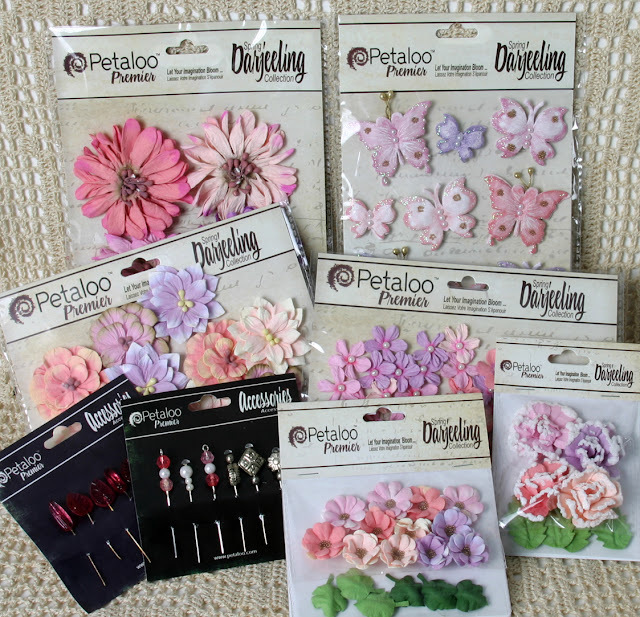 Petaloo put together this beautiful spring collection of Darjeeling for you!! 1: Visit all of the blogs and leave a comment on each. This way we know you were there. Become a follower if you're not already. Take your time. There are beautiful things to see along the way. 3: Finally, go back to the Swirlydoos blog and leave a comment letting us know how much fun you had AND tell us the sentence that was created with all of the special words you collected. The party starts over at Irene's blog. Have fun and good luck! In case of a catastrophic event with any of the blog sites, here is the order and the links! Looks like Glitz hasn't put their blog post up yet - I have all the words but that one! Glitz is a bit behind this morning! All the DT peeps stepped it up! Another awesome SD hop!! There are 3 kinds of people, those who can count and those who can't. I couldn't find anything on Glitz .But i had a great time and saw some awesome work!! There are three kinds of people, those (who?) can count and those who can't. The Designers' Projects are wonderful, thank you for the inspiration. I have finished your wonderful blog hop. All of the projects are gorgeous, so elegant. I have all of the words except for the word from Glitz, I could not find their post for this hop. The words that I have are: There are three kinds of people those ________ can count and those who can't. I am assuming the missing word is "who". Thanks for the great hop this morning, great way to start my day. Been right round the blog hop but couldn't find a word at Glitz. I'm guessing its "who" which would make the sentence "There are three kinds of people. Those who can count and those who can't" Ha Ha! Great inspiration at every stop. Thanks so much. This hop was wonderful! I loved to see all those beautiful projects that that wonderful women shared! Great blog hop. Glitz is still behind. Here is the secret phrase: there are three kinds of people those (who) can count and those who can't. there are three kinds of people those (who) can count and those who can't. Okay since everyone else is also having problems with Glitz I'm gonna go ahead too. I LOVE these blog hops! "There are three kinds of people those (who?) can count and those who can't." Fantastic blog hop!! !I can't find Glitz word...i quess..The sentences is"THERE ARE THREE KINDS OF PEOPLE THOSE (WHO) CAN COUNT AND THOSE WHO CAN'T. Awesome inspiration on this trail!!! Glits's word is not there yet. "There are three kinds of people those (Glitz) can count and those who can't. The hop was gorgeous as usual. Love, love love the tech kit and what the ladies have done with it. the sentence is - There are three kinds of people those who can count and those who can't. oh my oh my what a wonderful bog hop today. All the projects were so beautiful. I spent all morning getting my feel of inspiration. Thank you so much for having such a wonderful hop. such amazing talent. Loved all the layouts!! Fun hop! Lots of talent out there! Glitz is up and running now. "There are three kinds of people, those who can count and those who can't. " What great prize packs those are. Thanks for the chance to win. I'm off to start the hop. Can't wait to see all the projects. Thank you once again for the opportunity to win the prize packs. Visited all the blogs and I must admit, I can't help but drool at all the projects featured. They're all amazing work of art. Collected all the special words along the way and this is what I have: "There are three kinds of people - those who can count and those who can't". Thank you to all the blog hosts for your inspiration. I'm back! and how fun! I have all sorts of notes on some wonderful ideas! And your giveaway is amazing!!!! There are three kinds of people, those who can count and those who can’t. Thank you to everyone! I can't believe how long that took to go through all the participant's blogs. I totally went over my lunch hour and then some. I completely lost track of time looking at all those awesome projects. Thanks for another wonderful blog hop. The sentence is: There are three kinds of people, those who can count and those who can't. "There are 3 kinds of people, those who can count and those who can't"
Very fun blog Hop:)The sentence is: There are three kinds of people, those who can count and those who can count and those who can't. I just happened to run across this blog hop on FB today and so came over to check it out. I've been through the whole hop and I am so inspired. I love the kit, all of it and am now a follower of all the ladies on this hop. Here is the sentence. "There are three kinds of people, those who can count and those who can't." Hahaha, love it. I do have a question. I don't see where to order the technique kit. Thanks for an awesome hop and I'd love to win a prize! Loved this hop and all the inspiration I gleaned! Yo have such amazing people working on your team. I have a whole new list of blogs to follow! Amazing hop- so much fabulous inspiration! There are three kinds of people those who can count and those who can't. And the sentence is "There are three kinds of people, those who can count and those who can't"
Another super, fun blog hop! There are three kinds of people, those who can count and those who can't. Wow found some amazing inspiration on this blog hop and now have a some beautiful new blogs on my reader list!! "There are three kinds of people those who can count and those who can't"
Great blog Hop and the DT have really outdone themselves! Here's the sentence "There are three kinds of people, those who can count and those who can't"
Gorgeous, Gorgeous work from the DT... Yay round of applause, and to the manufacturers Glitz and Petaloo, THANK YOU so much for being a part. Definitely amazing inspiration and amazing products!! Cant wait to get the march kit and thanks for the support from amazing manufacturers!!! Sentence "There are three kinds of people those who can count and those who cant". Think i might be one of those missing three when it comes to counting chocolate muffins!!!! Thanks so much Krissy and the DT!!!!!! The sentence is: There are three kinds of people those who can count and those who can't. I had real fun visiting all the blog sites. The projects are amazing. I've found a lot of inspiration. And the sentence is: There are three kinds of people those who can count and those who can't. 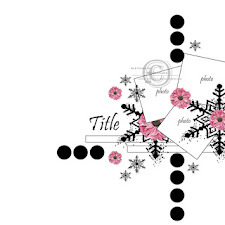 Love these blog hops and looking at all the amazing work! "There are three kinds of people those who can count and those who can’t." There are three kinds of people those who can count and those who can't. These ladies have out done themselves this month with this beautiful kit. I don't think I could pick a fav. I loved them all(wiping away the drool from my screen). My sentence is: "There are three kinds of people those who can count and those who can't". Thank you for a beautiful hop. What an incredible hop!!! Outstanding projects! There are three kinds of people, those who can count and those who can't. Thanks for a shot at some of your gorgeous stuff!! Great blog hop (as usual)! The DT brought it in a big way, and I am always so impressed by the versatility of the projects made from the same kit (and often even from the same kit and same designer!). The secret phrase is "There are three kinds of people, those who can count and those who can't." There are three kinds of people - those who can count and those who can't. It took me a long time to look at each blog and move on.. but end of all it was such a nice learning for me.. Loved all the creations of people.. This months hop was wonderful! I just love seeing all of the beautiful and inspiring layouts and projects that are created and shared! "there are three kinds of people those who can count and those who can't." awesome blog hop, lots of amazing work! 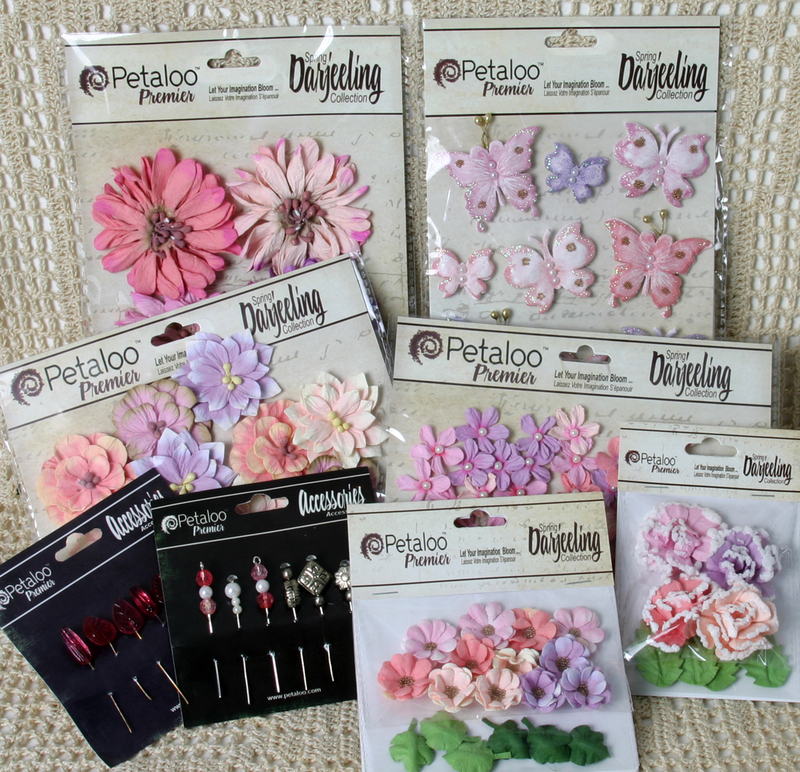 Ooh and all the new Petaloo, makes me smile. Wow, wow, wow!! The prizes are fabulous and then the projects... What gorgeous projects! This has been one of the best blog hops ever with such incredible talent! Here's the sentence: "There are three kinds of people: those who can count and those who can't." This was so much fun! Thank you for this amazing blog hop, I get to know talented scrappers and drool over their beautiful and fabulous creations - they have inspired me along the way. The sentence says "There are three kinds of people - those who can count and those who can't." All the best to Swirlydoos! Thanks again. There are three kinds of people, those can count and those who can't. Hopefully I'm the former, LOL! Loved all the beautiful work of your design team. Thanks for putting on the blog hop and taking us to see such wonderful pieces of art. I just loove all the stunning works I've yesterday and today at Glitz. You girls are amazing!!!!!!!!!!! Oops I forgot to leave the sentence from the blogsites. There are three kinds of people those who can count and those who can't. (LOL) very cute! "There are three kind of people, those who count and those who can't." It was really fun and so inspiring to visit all those beautiful blogs!!! Thanks for the opportunity to win your gorgeous prices!!!! Another wonderful blog hop. So much inspiration and such beautiful layouts. Our design team is first class! TaDahhh! Finished! Wonderful projects and ideas! There are three kids of people - those who can count and those who can't. special words: "There are three kinds of people - those who can count and those who can't". I've visited all of the blogs and left a comment on each! Thanks for the opportunity to win your awesome prizes! I want to thank you and all the lovely talented ladies who shared their inspiration on each of their blogs. I had an amazing time, learned some new techniques to try and was just blown away by their artistry! Swirlydoos kits are always amazingly beautiful, Glitz designs... gorgeous, Petaloo, always pretty! Thank you so much for the fun! the words from the blog hop: "There are three kinds of people those who can count and those who can't" Thanks for a chance to win amazing products. but even if I don't win, I come away Inspired and Renewed! What an amazing hop! I've seen incredible talent! I can't wait to win because... There are three kinds of people, those who can count and those who can't! Gorgeous work DT! I can't wait to play with my kit! Swirlydos, that was an awesome block party! 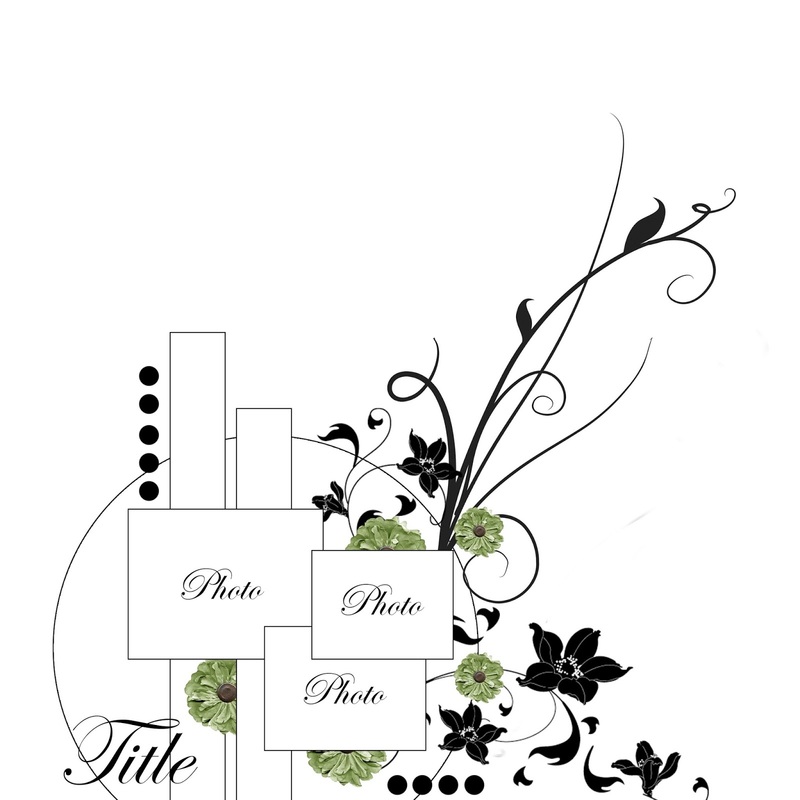 Designers did an awesome job with Swirlydos, Glitz,Petaloo and Canvas Corp products, great inspiration.Thank you! "There are three kinds of people, those who can count and those who can't"
Hats off to the lovely Swirlydoos ladies for another amazing inspirational blog hop! There are three kinds of people, those who can count and those who can't! Thanks for the opportunity to win some great prizes! I did blog hop but i was not able to leave comments I will go back and try again. The sentence is There are three kinds of people those who can count and those who can't. I finished my first hop...hooray!! I usually only get part way through before life intervenes. I loved all the gorgeous stuff to see, picked up some new gals to stalk...I mean follow, and got completely inspired. Apparently I am one who can't count because I had to read the sentence 2 or 3 times and scratch my head before beginning to laugh at myself. ah...life as a blonde. There are three kinds of people, those who can count, and those who can't. Great blog hop. So excited about this month's kit. So much gorgeous-ness! There are three kinds of people. Those who can count and those who can't. "There are three kinds of people, those who can count and those who can't. " Wow!It always amazes me how you can give everyone the same kit and such different and individualized art is created..very inspiring! Had Fu..Fu..Fun on this Blog Hop! Thank you Swirlydoos for such wonderful inspiration! And to the ladies on this Blog Hop..you girls rocked it! 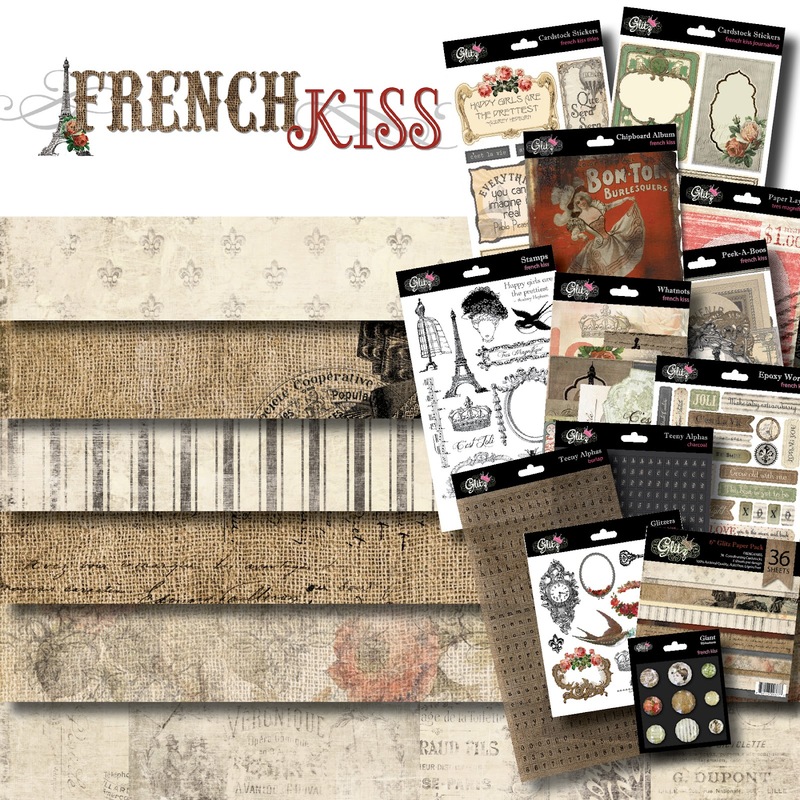 I'm pretty much speechless.this is the most amazing blog hop I have ever participated in.Your design team is incredible.I have never seen so much beautiful inspiration gathered together like this.Thank you so much for putting this together.Checked out the store and your kits are gorgeous.Maybe with all this talent to learn from I could do them justice. See I was so overwhelmed,I forgot to key in the phrase. "There are three kinds of people.Those who can count and those who can't." Took me way too long to get it.I am definitely getting old. OK great looking at all the site. I enjoyed this very much. Special phrase "There are three kinds of people. Those who can count and those who can't" The third type of people are old and confused and took forever to get this. TY for all your work. okay, was this a trick quote trying to see if we were paying attention? "There are three kinds of people. Those who can count and those who can't." What's the third kind? Love all the reveals. Such great inspiration. The quote doesnt make sense without Glitz's word/s, "There are three kinds of people those ..... can count and those who can't" thats only two kinds of people! Nevermind the kit is awesome and the blogs sensational! wow - what killer prizes and amazing work by all!! can't wait to get my kit now! Beautiful work as expected. Thanks for sharing. "There are three kinds of people those who can count and those who can't." Really enjoyed this inspirational blog hop! I was so totally mesmerized by the amazing work that I couldn't keep up with the March Madness basketball games!! "There are three kinds of people. Those who can count and those who can't." I had fun but was too rushed because your hop closes in 15 minutes! I'm definitely going back to each blog over the weekend. The artwork looked sensational! The sentence is: There are three kinds of people those who can count and those who can’t. Funny, funny! Thanks for all the inspiration!!! All the swirlydoos girls did an awesome job!